Once upon a time children only had wooden toys to play with. Their imagination soared while their fingers run through the wooden texture and they could be kings and queens, soldiers, doctors or even aviators. 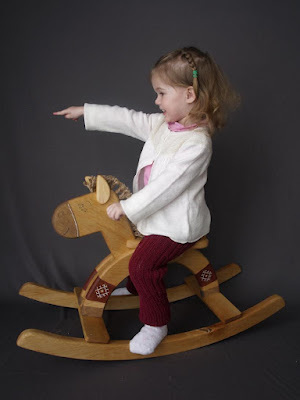 Today, a wooden toy is a luxury but one that we owe our children. The interaction that goes on between a young innocent hand and the wood educates more than we know. 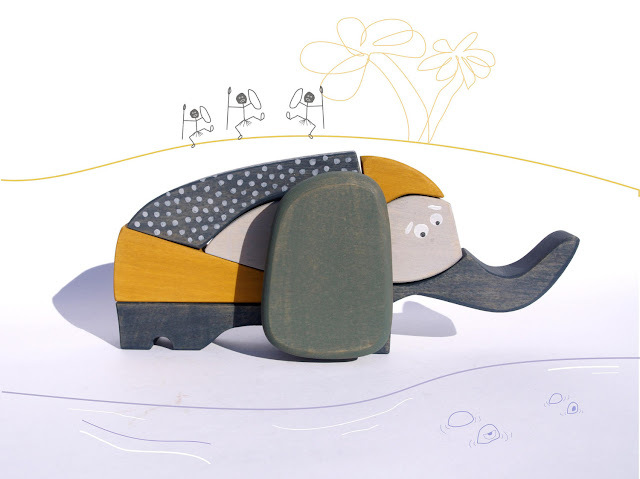 A lovely duo from Lithuania has taken the step from dreaming to doing and today you can learn more about what makes people start creating wooden toys. Welcome to the world of Friendly Toys. 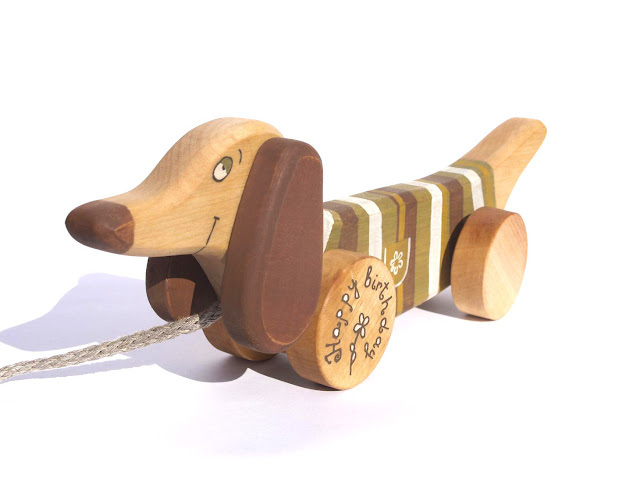 How did you come up with the idea of making eco-friendly wooden toys? When we started planning our first child we realized that we wanted her to grow up in a different environment, and we totally changed our lives. First of all we moved from the capital to a lovely forest and began a new life without any employers and guarantees. This step helped us get to know ourselves better and ask what we really wanted to do and what we were able to do. I know it sounds very dramatic and crazy, but indeed everything happened very naturally. The idea of making toys was not planned. After our daughter was born we started looking for safe, natural and beautiful toys. Unfortunately, these qualities could not be found in commercial toys. 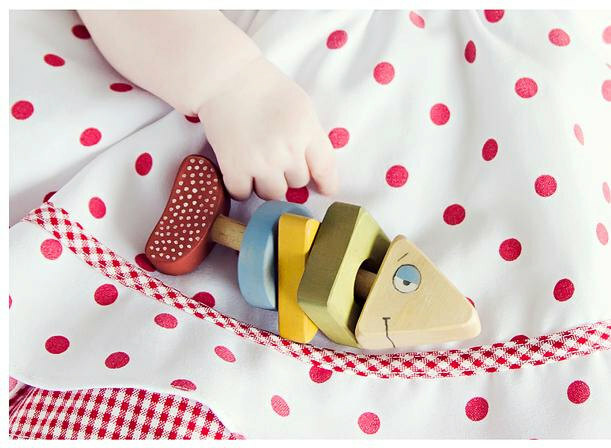 Frankly speaking, our toy-making story began with the idea “but we could make it better…” and step by step we started creating our own wooden toys story. How long after you first started making them did you set your etsy shop? The first time we showed our wooden creations to the world was at a traditional craft fair. Happily we had a great success there and we decided to continue. We opened the Friendly Toys shop approximately six months after our debut. How do you make sure all materials are eco-friendly? The creative process starts with a long time researching information and suitable materials. There are plenty of materials which are certificated and considered to be safe and suitable for toys, but all in all they contain chemicals, which are only less harmful but not safe. That is why we use only natural and biodegradable materials. For example the milk paint we use is based on milk protein and all color pigments are natural. We love that it is natural and that the colors are warm, cozy and very beautiful - exactly what we need. Furthermore, raw linseed oil provides not only water resistance, but also very good smell for our wooden creations. The materials we use are birch wood, milk paint, raw linseed oil. As a family working together how do you inspire each other? Working together is a great challenge for our family. It is our first project together, so we have to learn how to communicate not only as a family, but as colleagues also. In our previous lives we didn't discuss work at home and now that we work at home we have to learn how to stop talking about work. The best part of working together is that all challenges, achievements and failures are common. Working hard together we can reach success together and that is very pleasant. We have common goals now and have to encourage each other regularly to reach them. How do you come up with the designs for your toys? after all discussions and arguments we come to a final image, which always looks better then the previous one. Probably we won’t be able to achieve this separately. Can you take us through your creative process? First of all we have to decide the nature of the toy we want to create (for example a dog, a fish, a goose) or its function (for example pull toy, push toy, teether…) After that if we have an exact object (a dog) we try to find the kind of toy that will be the most appropriate as a dog (and we got a pull dog). 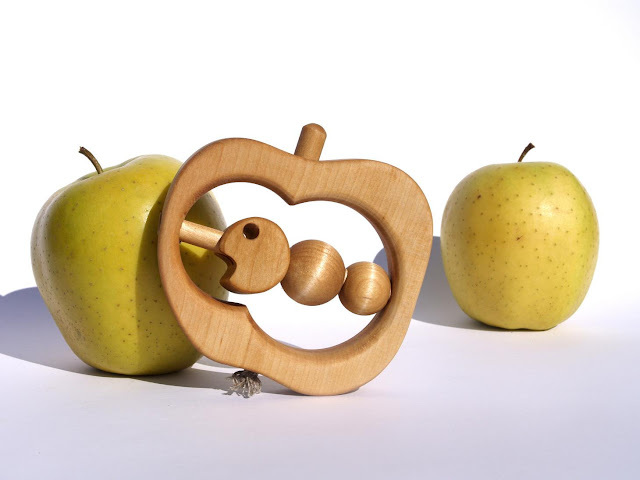 On the other hand, if we have the kind of toy (a teether) we try to find the object that is the most suitable and would look most natural (and we got an apple teether). If you could make one project, regardless of price, what would it be? Hmmm… this is a hard question… let’s see... it could be a whole kid's room project. I see the wall covered in a mixed media forest - imagine paintings combined with wooden decorations, decorated book shelves as tree branches. some of the wooden parts could be mobile (detachable leaves, mushrooms and so on) so that the child could change her environment while playing. And this could be a home for a few wooden toys. For example a squirrel with its own tree hollow, a bird in a nest and so on. I love and personally own some creations of Baubukas. This title translates in English as “Bugaboo-home spirit”. These are wonderful and cute jewelry for women too big for playing with our toys, but still willing to have some cute, cozy and mysterious creatures with them. wonderful! I love wooden toys. i think these are simply beautiful ... my children are grown but I have so many of their wooden toys and puzzles..they are priceless !! Oh my gosh, I love the worm inside the apple! I grew up in the age of plastic toys, but some of my favorites were my wooden blocks. Endless entertainment with those things. Oh, I love these toys! If I were to ever have children I would buy toys like these. I was oohing and aahing over every photo! These are so great. I'm saving their shop for the next time I need a baby gift. Thanks for this! I've got a brand new niece and these are wonderful toys. Love that stripey dog -- totally makes me smile! Nicely done! What a wonderful story. There toys are beautiful and what a special gift they would make.